When the image of my brother-in-law’s mangled car appeared on the television, the room went silent. Together with his two sisters and a friend, the four of us watched the news report depicting his fatal car crash from barely 48 hours earlier. The news report was brief: Douglas Bonham, a 30-year-old teacher from Silverton, and his 16-year-old passenger, Matthew Albrecht, were killed near Molalla when Doug’s car went off the road. Altogether, the report lasted maybe one minute. It might have been longer, but it seemed quick. “Well, now we know what that feels like,” I said as the next news story began — ostensibly leaving our Doug in the past to be forgotten. No other words were said. The room remained quiet as we each fell into our own minds. Seeing a news report about Doug, while sitting on Doug’s couch in Doug’s living room watching Doug’s TV, was entirely surreal. And the days that followed were a blur. I remember thinking about all the car accidents and police press releases I see in a week. I remember thinking of how unfazed I typically am when I see them — how little I consider the families that are affected by these tragedies. 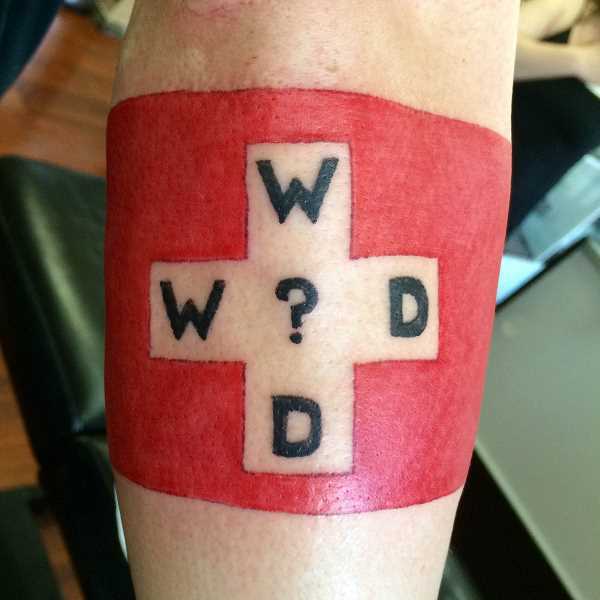 Three weeks after Doug died, on what would have been his 31st birthday on March 31, I got this ‘What Would Doug Do?’ tattoo on my right forearm. The Swiss flag design commemorates how Doug tried to provide a neutral, safe haven in family arguments, earning him the nickname ‘Switzerland.’ Stacie and Shelly got Doug-memorial tattoos on the same day. It’s not because I’m some callous reporter — some news media monkey that just digs dirt and rakes the muck like some bad-news churning machine. It’s because I’m human and empathy is difficult at a distance. But as I pondered the news report and the continuance of my life without Doug in it, something profound struck me: This really truly is what it feels like for every person who experiences this kind of loss. It changed my perspective as a reporter. It changed my perspective as a human being. Until you’ve lost someone dear to you, there’s no way of knowing what that pain feels like. It’s emptiness. It’s sadness. It’s numbness. It’s an indescribable heartache that rattles the very core of my being. And it’s a feeling shared by every person who loses a loved one. Two days before Doug’s crash, I interviewed a homeless man who told me about losing both his parents and his 2-year-old daughter in a five-year span. He had turned to drugs to ease his pain. At the time I thought I understood why he’d do that — I mean, it made sense. That kind of loss sounds unbearable. But considering it with Doug’s death so fresh gave me a different insight into what he was going through. We all dealt with our grief in our own way. Doug’s wife and their two kids, Stacie and I, our kids, and Doug’s other sister, Shelly, with her husband — too many people to name, honestly — we all dealt with it together but separately. Even now, more than a month later, we’re all still dealing as best we can. The waves come unexpectedly. Sometimes they come with a laugh, sometimes with tears. Yet what I know for sure is that I’ll never again take for granted a news story about death. All life is precious. I believed this before Doug died, but empathy is difficult at a distance.